mushrooms | Morning Coffee . . . If you’re looking for a fairly quick, really delicious meal – look no further. This recipe is just plain ‘ole YUM!! This is a combination of several recipes that I’ve tried and combined to come up with just the right flavors for the stuffing for these mushrooms. 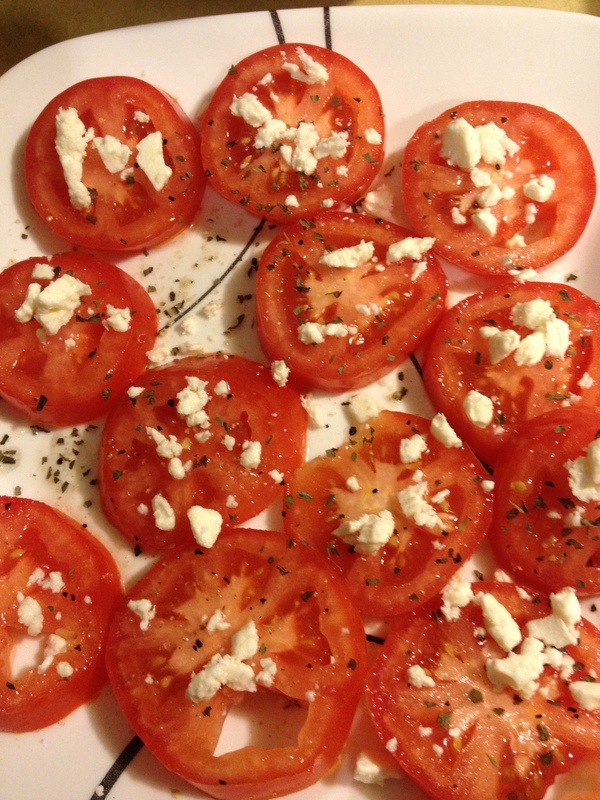 Serve with a Caesar Salad (or the salad or side of your choice) and you have a meal! Remove stems from mushrooms and take a spoon and dig out a little cavity in each mushroom. Finely chop the stems and the scooped out insides. Place mushroom caps on baking sheet, open cavity up. 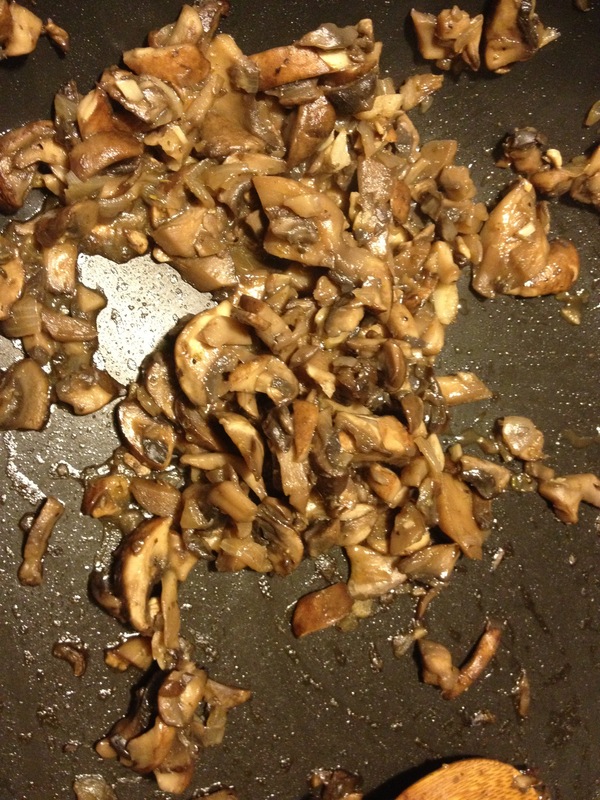 In a skillet, heat the oil and add chopped mushroom stems, garlic, oregano, onions and thyme. Cook over medium heat for 5 minutes, stirring often. Transfer to a mixing bowl. 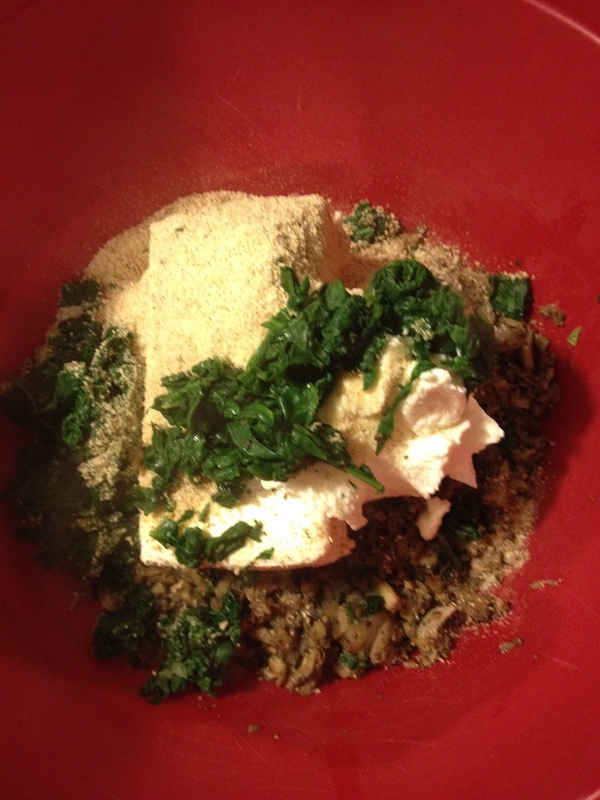 Squeeze moisture from the spinach and add to cooked mushrooms, along with cottage or ricotta cheese, cream cheese, Parmesan cheese, shrimp (if desired), breadcrumbs, mustard, & cayenne pepper; mix well with a mixer. Top each mushroom generously with filling. 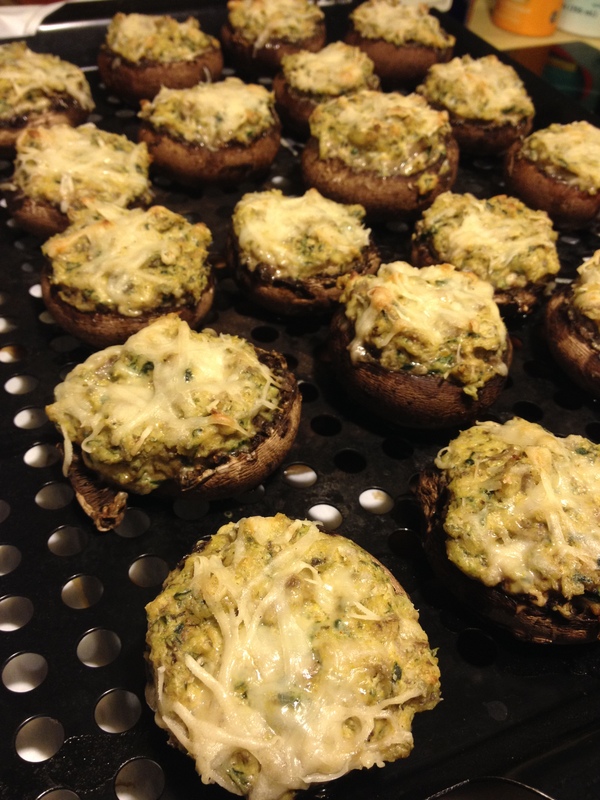 Sprinkle each filled mushroom with a little shredded Parmesan cheese. Bake at 400 degrees F. for 20-25 minutes until mushrooms are tender. Serve warm. Just a side note: When baked, the mushrooms tend to leak juice, so they end up cooking in that juice. 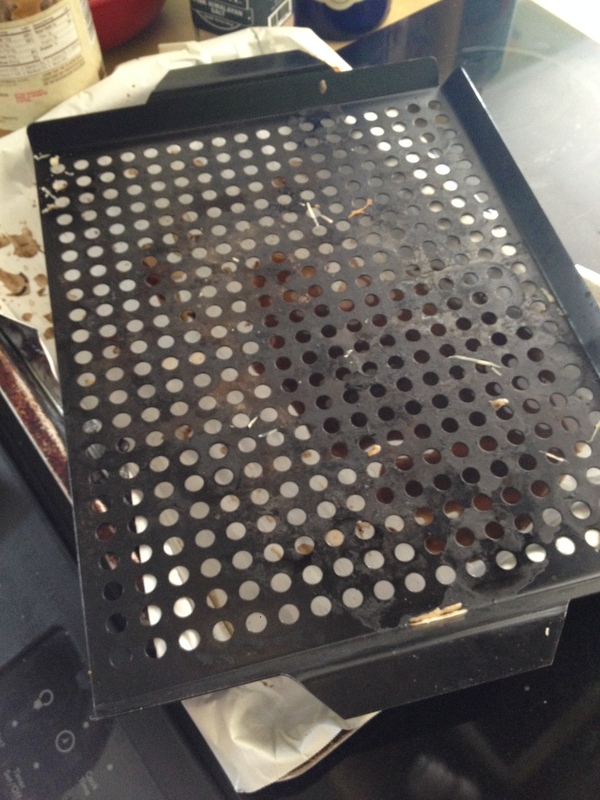 I put mine on a grilling rack and place that rack on a parchment-lined baking sheet. This allows the extra moisture to drip off and the mushrooms aren’t sitting in that moisture during baking. (This was my daughter, Jenny’s idea 🙂 ) . It keeps the mushrooms from becoming soggy. 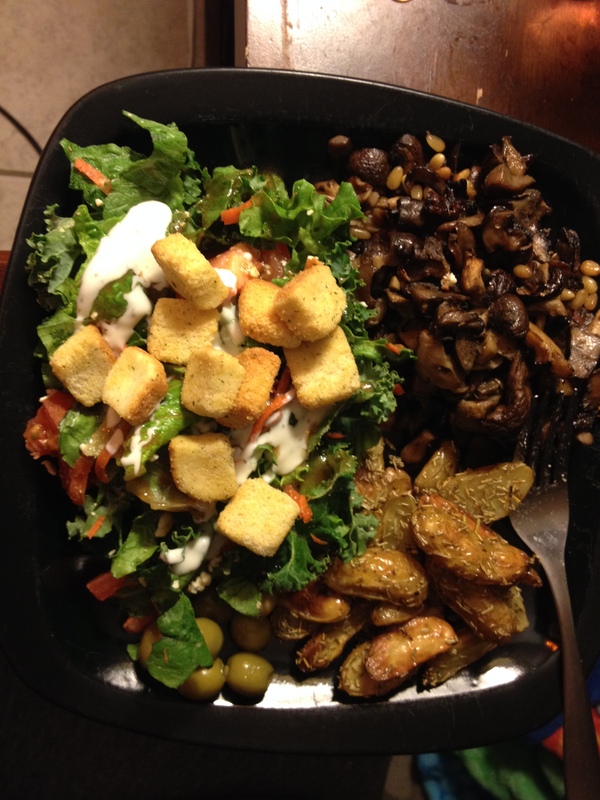 I served my mushrooms with sliced tomatoes drizzled with olive oil and sprinkled with feta cheese and salt and pepper…also, a kale and spinach salad drizzled with a little Caesar and Balsamic dressing and fresh pineapple. 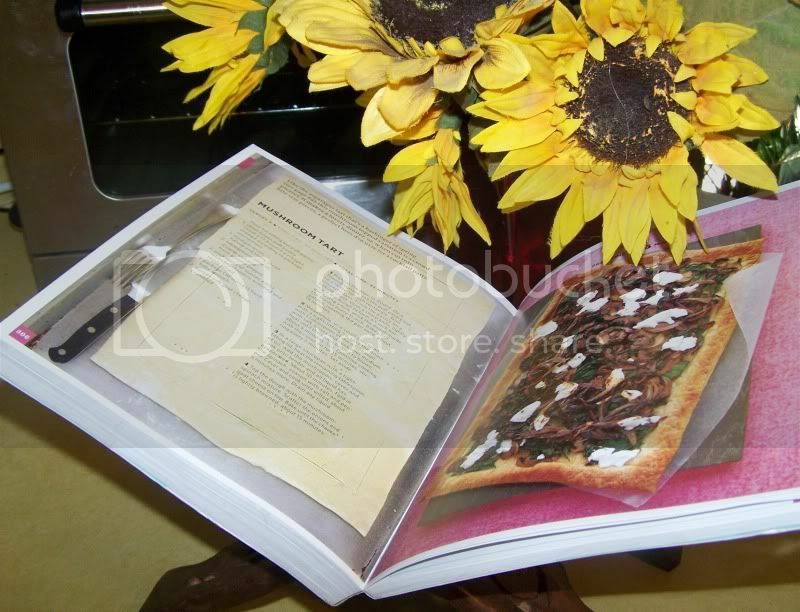 I was recently given a cook book from some good friends (Jassie & Daniel). This cookbook is from Williams-Sonoma called Vegetable of the Day. It’s by Kate McMillan and has 365 delicious recipes for cooking vegetables. 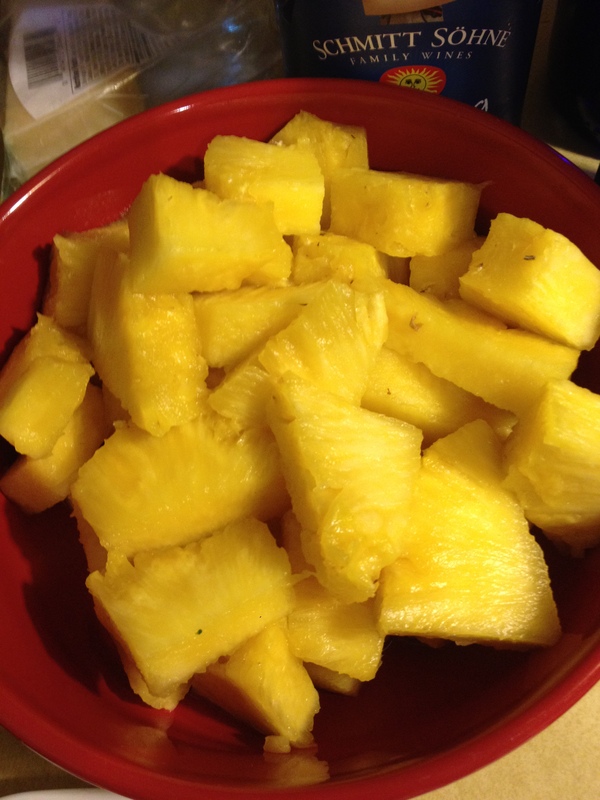 I wanted to share two of these recipes with you that I made last night…yum, yum, yum!! 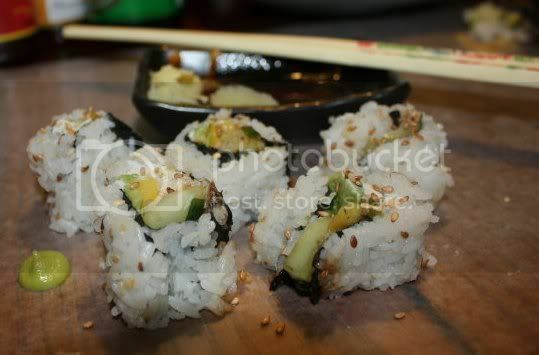 This recipe was cooked with entirely organic food :). 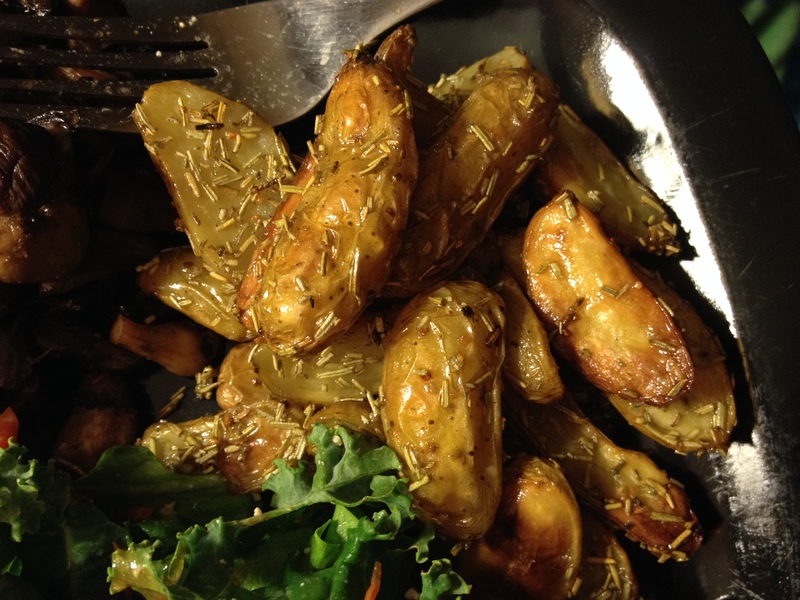 ** I added a little thyme and oregano to the mix (sprinkled over the mushrooms before roasting) – I just like these flavors with mushrooms, but this is totally optional and not a part of the recipe. 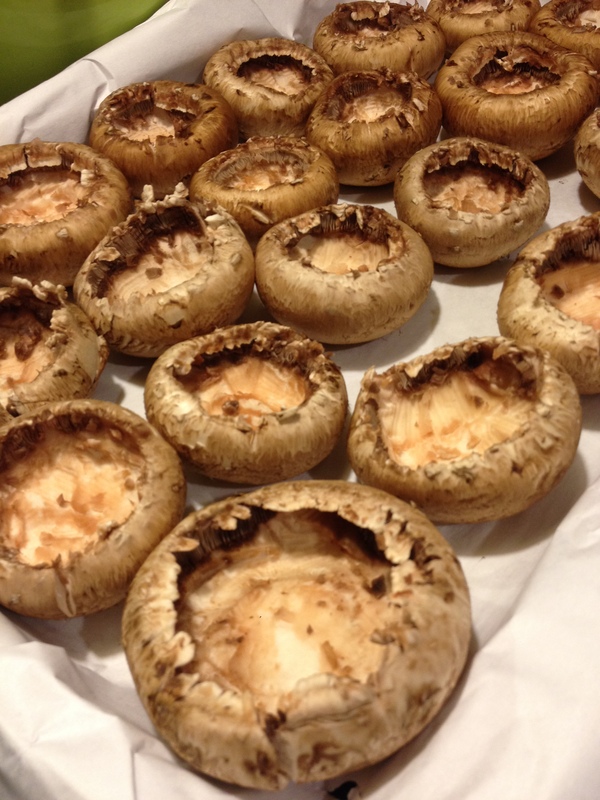 Preheat the oven to 450 F. (230 C.) Cut the larger mushrooms into pieces so that all mushrooms are close to the same size. 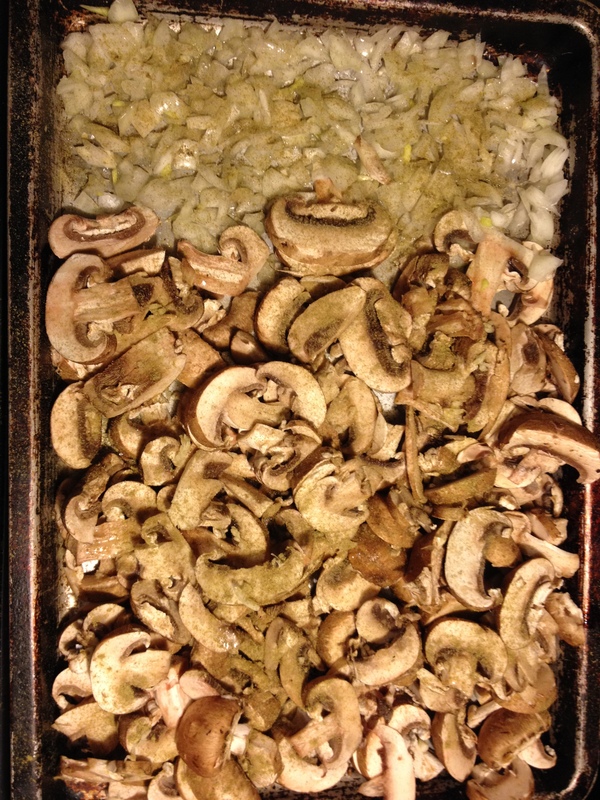 Place cut mushrooms in a single layer in a large roasting pan…you can leave the smaller mushrooms whole if you prefer…. Mix together the butter and garlic, season with salt and pepper and dot the butter mixture evenly over the mushrooms. Sprinkle the wine over the mushrooms. I also sprinkled some thyme and oregano over this mixture because I like those flavors with mushrooms. Roast the mushrooms until they begin to sizzle and brown, about 15 minutes. 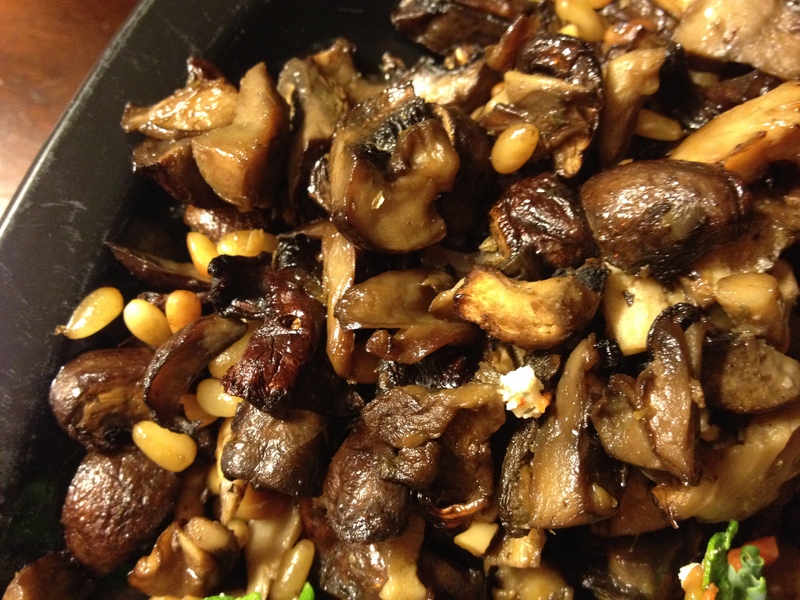 Take mushrooms out of oven and sprinkle with pine nuts…return to oven and roast another 10-15 minutes or until the mushrooms are cooked. Transfer mushrooms to a bowl and sprinkle with chives…enjoy! Preheat the oven to 400 F. (200 C). Put the potatoes in a bowl or a plastic bag and add the oil, rosemary, salt & Pepper. Turn the potatoes (or seal and squeeze the bag) until potatoes are coated. Spread the potatoes on a roasting pan and scatter the garlic over the potatoes. Roast until the potatoes are golden brown and tender …anywhere from 10-20 minutes. Season with salt and serve. 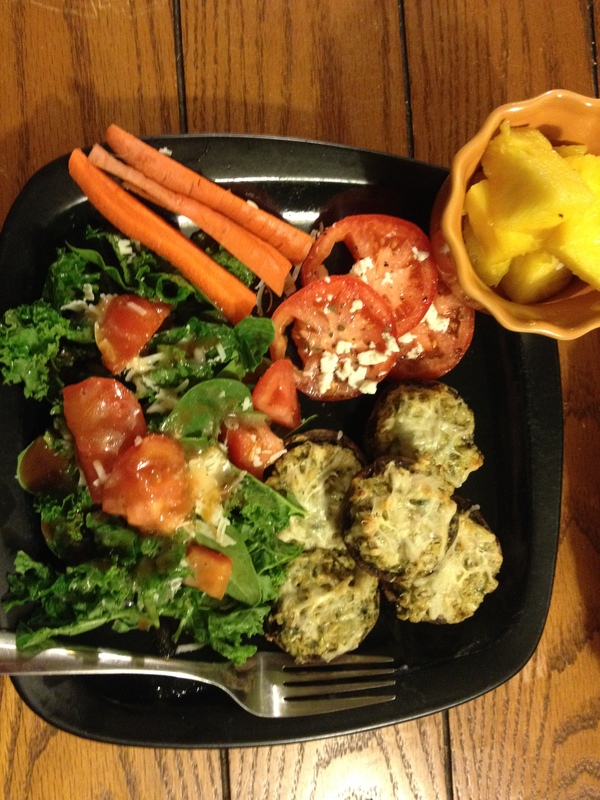 I hope you enjoy these dishes…they seriously were yum!! I love the cold weather we’ve been having lately and when it’s cold like this I like to try new soups! I love a soup that is hearty and savory! This soup meets both of those requirements! At first glance, you might not think that it’s either of those because it’s not a cream soup…the texture of the broth is thin and runny…but oh my, you will be surprised at how savory, warming and rich the flavors are! I love this soup and it will now be a winter (and summer) staple in my house! First of all I need to give credit to the blog that I got this soup from. 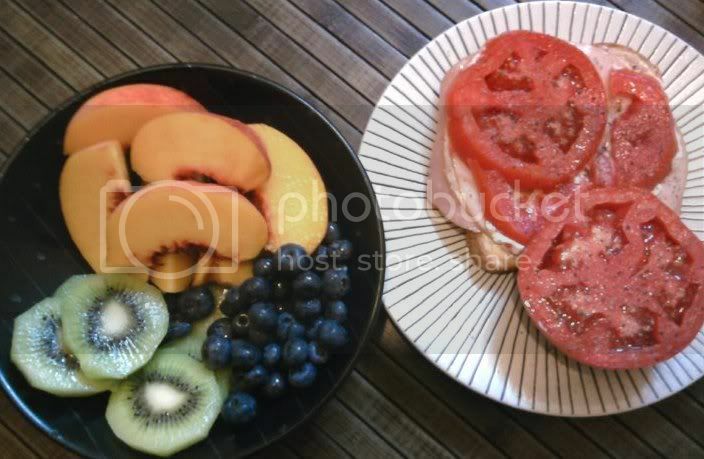 Gluten Free and Fabulous is a wonderful blog for great recipes that are gluten free…like this one! Preheat the oven to 400F. Slice up the mushrooms and place on 1/2 of a baking sheet. Place the diced onion on the other half. Cover onions and mushrooms with 1 tablespoon of olive oil, half of the garlic, 1/2 teaspoon of pepper and a teaspoon of salt for each side. Sprinkle 2 tablespoons of thyme over the top and place in the oven for 10 minutes. Remove and turn the vegetables over and place back in the oven for 10 minutes. While they are cooking, In a large pot add the vegetable broth, beans, grated ginger and 2 tablespoons of thyme. Cook over medium high heat and bring to a simmer. Place about 4 cups of the broth (including beans) and the roasted onions into a blender or food processor and puree until smooth. Add back to the stock pot, then add the mushrooms. Reduce the heat to medium low, and cook for 30 minutes. It smells sooo good and tastes even better! I served it with hard toasted rolls (and butter) and some grated cheddar cheese on top, but Parmesan would also be good…or no cheese at all! It’s sooo yummy and…it will warm your belly! This dish was soo yummy, oh my. 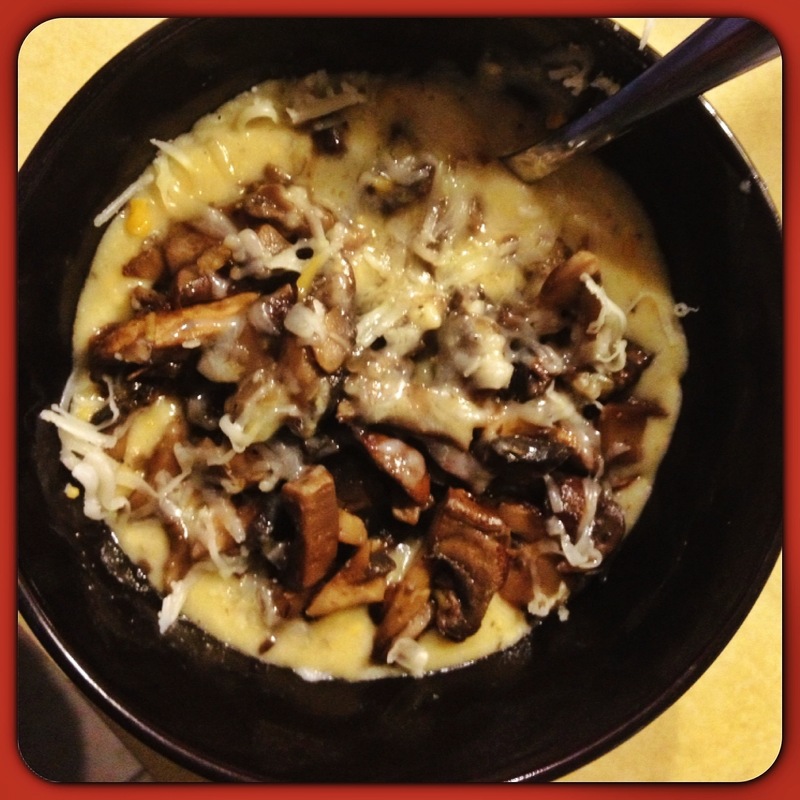 If you like grits and you like mushrooms in a savory garlic and shallots wine sauce, then you’re going to LOVE this dish!! I know what they say about Polenta – that it’s the same thing as grits… But I think there is a slight difference. Polenta is made with a very finely ground corn meal (usually yellow corn meal) and it’s got more of a porridge consistency to it…However, regardless if you think polenta and grits are the same thing or not though, this meal is very very tasty and I don’t think it would have been the same had I used grits! **you can also use a mixture of mushrooms (which is what I intend to do next time – shitake, oyster, portobello – whatever your favorites are). I started cooking my Polenta first so that it can be cooking while I’m preparing the mushrooms. To cook polenta you use 3 parts water to 1 part finely ground corn meal. 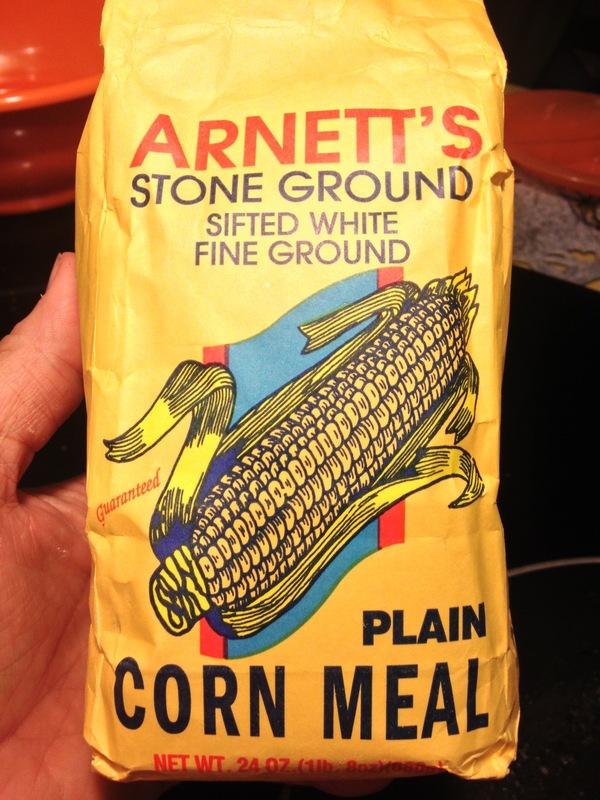 However, I wanted mine to be not so firm, so I used 4 parts liquid to 1 part corn meal. In fact, I used 3 cups of vegetable broth and 1 cup of water to 1 cup corn meal. You can also use chicken broth if you want that flavor. Bring the liquid to a rolling boil, then add your corn meal S L O W L Y stirring with a whisk as you add. I also added some oregano, rosemary, sea salt and pepper to this mixture. 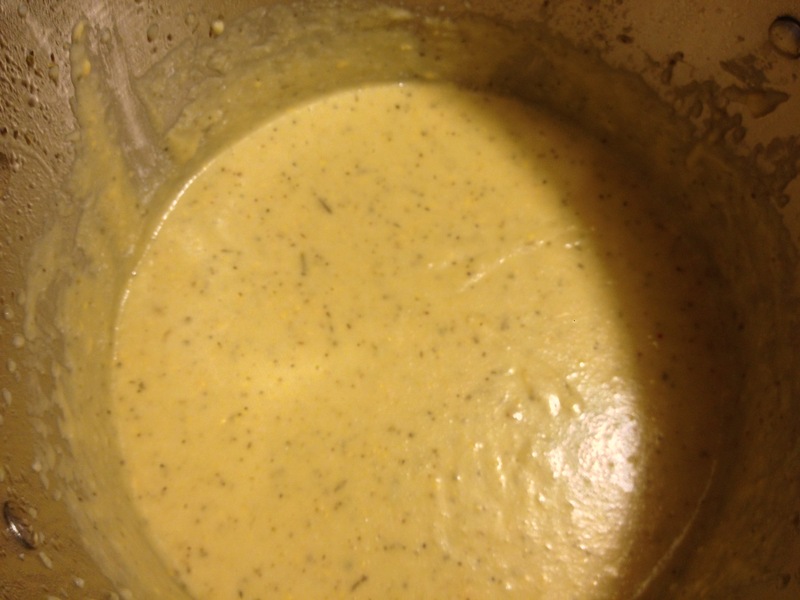 Reduce to low heat, cover and cook, stirring occasionally, until thick and creamy (approximately 15 minutes). Stir in the cheese. Remove the polenta from the heat. 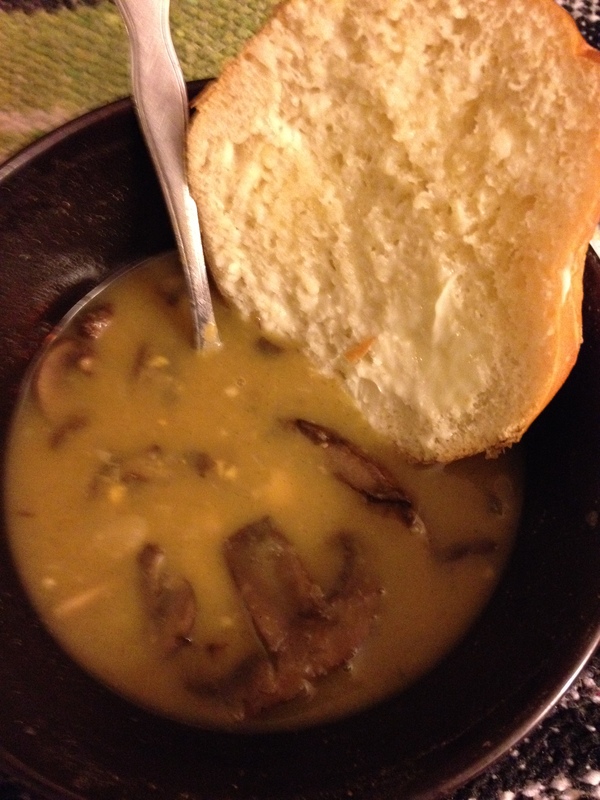 When the mushrooms have cooked down (they create their own water), add 1/4 cup white wine and 1/4 cup veggie broth. Allow this to cook until it begins to thicken, season with salt and pepper to taste. Then add 1 TBLS of butter. Serve a cup or two of the polenta topped with a cup or so of the mushrooms. 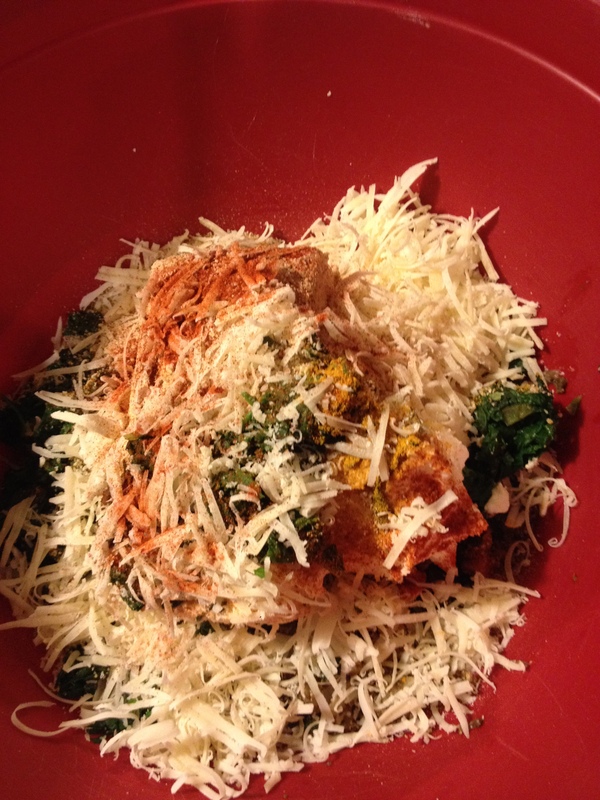 Sprinkle with grated cheese of your choice (I used Vermont white cheddar) and enjoy!! Mmmmm, I loved this dish so much that I want some more right now because writing about it is making me want some 🙂 I hope you enjoy it as much as I did!